Note that all the units used in the early literature about the Bayeux Tapestry were feet and inches. When analysing the dimensions of the images it turned out to be much more convenient to use imperial measures. The V&A museum gave me access to some full sized images to allow the sizes of the Bayeux Tapestry to be assessed. These are the measurements, and rationale, behind the size of the Fulford Tapestry. The preface will have a 21inch working area width. The original varies between 18-20 inches. Both margins are 4 inches wide. These lines are in a medium ochre. Both margins can be ‘invaded’ by the main narrative if the design requires it so the lines are not automatically in the front and might have some breaks. An old style font has been used as a guide in the design but the lettering would look fine if it was freehand. The language chosen is English (as there are not many Latin speakers around now). The top and bottom margins have ‘bars’. In the original, they vary in size, grouping, thickness and even angle. It was not possible to discern a pattern - perhaps the coordination between the various houses where the sections were being embroidered was imperfect for the marginal designs. 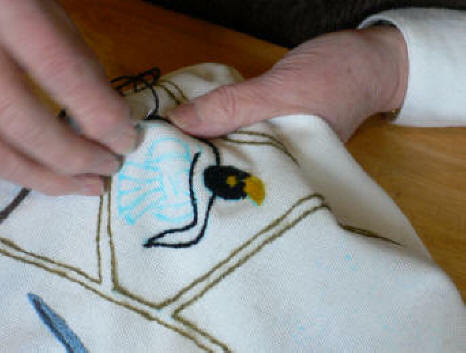 The Fulford embroiderers have been given considerable licence to adjust these and to add ornamentation to the bars. However, the design aims to have a ‘tent’ (opposing bars) in the centre of each panel to help focus attention. The spacing of the bars varies a little to suit the images they contain. But the angle of the bars has been kept consistent. The bars are used to separate the sections of the border. There are no fixed rules but the design has used them in a reasonably consistent way. They attempt to bring a focus to the images below in the central panel. The use of the bars is however constrained by the shape of the images they surround. The design provides a simple bar to mark where they are to be placed. However, the embroiderers are free to design the bars or add a double bar if the space permits. The bars themselves can be embellished and designs can be incorporated between double bars and surrounding single bars. There is scope to incorporate personal initials or icons into these embellishments. The only constraint is that these should be made with the outline stitch but very small areas of laid work are acceptable. The embellishments should also respect the space of the adjacent action. The bars can be filled in a variety of ways to suit the mood or the preference of the embroiderer. They also ensure that there is a pleasing spacing along the borders and there are no large empty spaces. Some samples of ornamenting from the Bayeux border. They are used to divide scenes in the borders and to separate or fill in the bars. These can be derived from geometric patterns or nature to suit the situation. They use the outline stitch. The landscape is marked with some stylised lines to indicate ‘stony ground’, ‘marsh’, ‘sea’, ‘beach’ and ‘grass’. These must not dominate the panels and should not be intrusive. They can be laid over other images if that is appropriate, such as sea or if people are stuck in a marsh. Putting the lines in early had many advantages: The lines provided a guide to the tracing of the drawings and far from becoming distorted as other images were added, the edging lines seem to allow the embroiders to judge the tension. We think that designs used to be transferred by pricking little holes along the design lines and then placing the pin-holed pattern onto the cloth and banging or dusting it with a bag of coloured chalk or carbon. We used a special pen that fades, does not mark the cloth permanently and comes with a chemical so it can be erased. The material will be a fine, slightly bleached linen. Fresh linen is too dark (‘linen coloured!’). 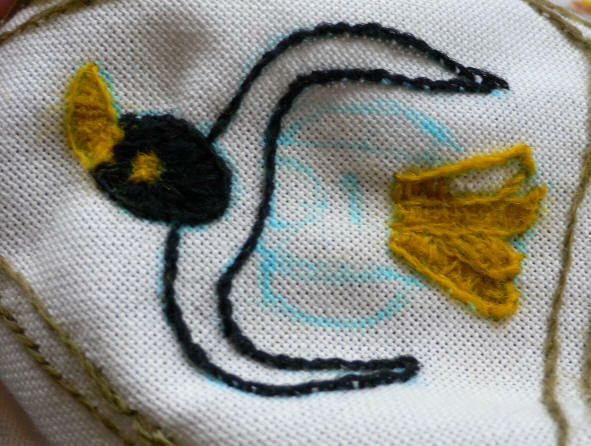 The gauge must not be so tight that it is difficult to embroider and it must be possible to trace the image onto the fabric. The intention is to provide a backing material of calico to make the tapestry more robust and easier to display when it is completed. A close examination of some sample images from the Bayeux Tapestry suggested that the fabric was 18/19 tpi warp/weft. The fabric used was sourced from a mill on the Baltic Coast, through a merchant in Hamburg. Sadly all of the British linens were either natural or chemically bleached.